Find hotel near Velo Service - Bike Renta ..
Great service, communicative and professional staff, friendly and knowledgeable guides, and their easy location, is what is making Velo Service - Bike Rental & Tours one of the most sought after options by visitors at Bari. Also, not to mention that they are much cheaper than other guided tours of the city. They operate at Bari as well as the adjoining areas. Promoting the simple pleasures of biking since 2008, this group has moved beyond the modest bicycle. The less adventurous visitor can now opt for a cycle rickshaw tour as well. You can also book through their online form. As long as it takes you to plan out your tour. Recommended time to visit before start tour 8:00 am. Rs 4000 and up depending on the mode of conveyance you choose. 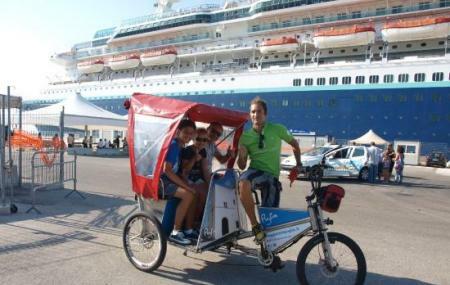 How popular is Velo Service - Bike Rental And Tours? People normally club together Basilica San Nicola and Bari Cathedral while planning their visit to Velo Service - Bike Rental And Tours. We just got back from bicycle tour. We were lucky that we found this company. Good prices and very good service. Warmly recommend this company. Wir hatten eine sehr schöne Tour. Absolut zu Empfehlen!